corporeality of the absent body. Spain. Luisa knew why, but she did not know how or where her father Martín was killed. committed against civilians like Martín during the Spanish Civil War. 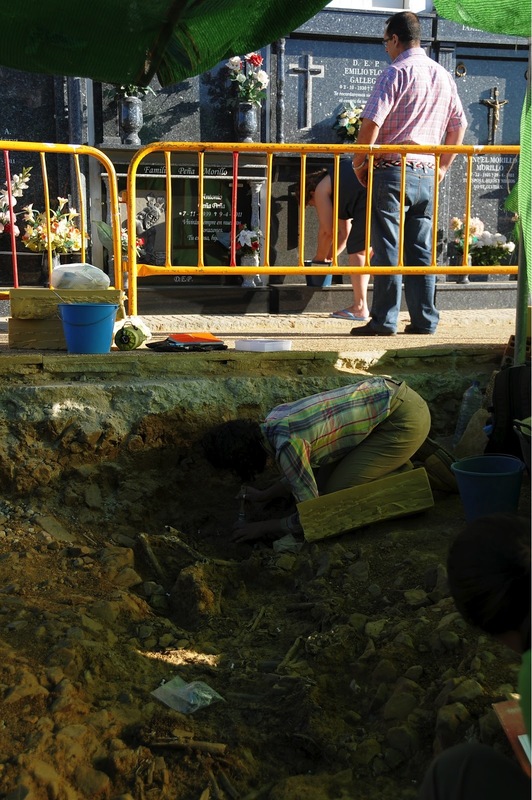 Figure 1: Anita, another family member of the killed, visits the San Pedro exhumation (August 23, 2012, photo courtesy by Rui Gomes Coelho). Equipped with his photo and the memory of his boots, Luisa, like many daughters of the Civil War period, awaits the body of her father. “Yo tenía mucha falta de mi padre, I missed my dad a lot—I don’t know if that happens to all girls.” For many children born during the war, the single, spectral photo of their relative is a provisional placeholder for the body they cannot find and the person they now only knew (Crossland 2009). The body, Luisa notes—it’s what we don’t have: we have the memory of boots but no feet, we have a photograph but no person. In the absence of the dead’s body, the living fear that the presence of violence can become absent, unhinged from the bones and persons it has affected. 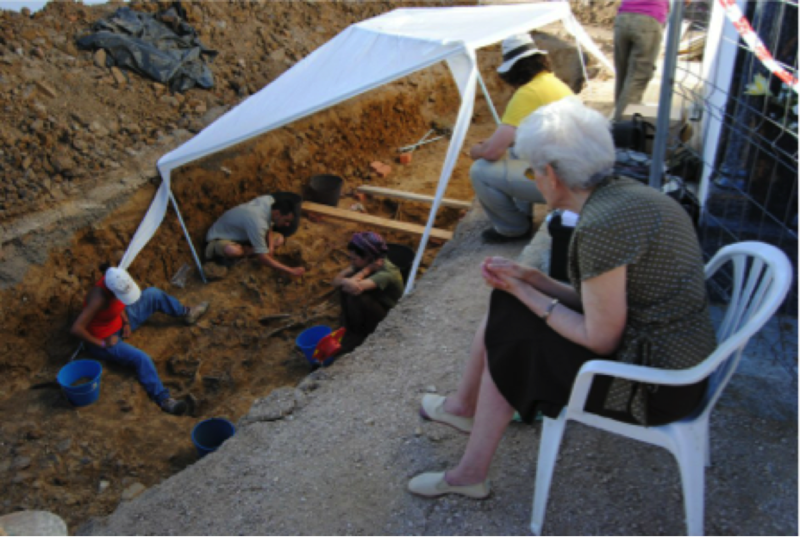 Yet unlike the bodies of asylum-seekers in France whose word is authorized by medical expertise (Fassin with d’Halluin 2005), the exhumation of the lost in Spain is a collaborative process driven by local and descendant communities together with archaeologists and local historical memory associations. In the case of Martín, Luisa devotes her evidence and truth into a body—a body that they may never find, and a corporeality that she must actively maintain into existence. In this manner, the corporeality of Martín’s absent body is paid homage by his family and community because to not do so would be to refute the killings and violence of the war. Ana, like many Spaniards who grew up at the end of the dictatorship, uses the human rights term “desaparecido” or “disappeared” to refer to her grandfather and other victims killed by the Nationalist army during the Civil War and subsequent Francoist dictatorship (Ferrándiz 2010:163; Ferrándiz 2011). This much we knew: Martín was killed and left in an unmarked grave in the cemetery of San Pedro, an earth so cracked and dry that bones exhumed here pulverized at your touch. 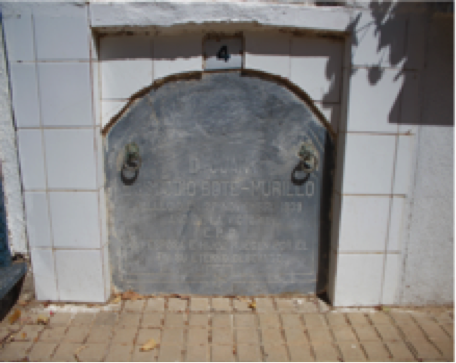 ￼Figure 2: The author exhumes inside an unmarked Civil War grave while a family behind her cleans off their tombstone in the nichos, or nests (September 2012, photo courtesy Xurxo Ayán Vila and guerraenlauniversidad.com). 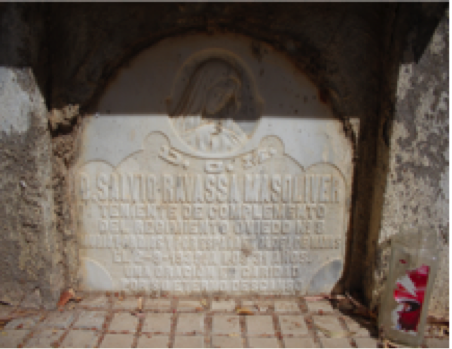 My exchanges with Luisa and Ana inside and outside the grave reveal feelings and interests that may seem irrational to the pursuits of exhuming in Spain. Yet if we are to approach the exhumations in San Pedro as a ritual process reflective of such interests, then what Luisa, Ana, and other descendants of the dead contribute to this process plays an important role in how exhumation is performed. The context of when a grave is opened is contingent on the political climate surrounding the exhumations, as well as the sentiments circulating in Luisa’s home. Following the end of the war and dictatorship, Martin’s exhumation had not been possible because of the national and familial silence of his existence. The desire to produce knowledge and a body of Martín’s existence points to the varied practical and symbolic interests involved in exhuming today, over 70 years after the war. These everyday actions, enacted in the spirit of Ana’s genealogical work and Luisa’s photos, also form part of exhumation ethos. “There were two classes of citizens: those that had won the war, and those who had lost. It was like in India—do you know of the caste system? It was the same here,” Ana tells me. “Because of your religion!” emphasizes Luisa, recalling the memory of her family being forced to go to church as was expected in those days in San Pedro and throughout Spain during the dictatorship. “The losers were segregated [from the war victors]—they didn’t even go to the same dances together,” adds Ana. “It was a Nationalist-Catholic regime this Catholicism, so everyone went to mass.” Catholicism in Spain, explain the women, was not just a religion or regime, but part of everyday life. During the war, this habitual part of Spanish society determined who was killed and who wasn’t. ￼Figure 3: Examples of Nationalist tombstones in the Castuera cemetery. (August 2012, photo by author). In the case of Martín, his brothers Juan and Jose, and their father Francisco, they were killed not at battle as soldiers, but at home as civilians. They were killed because they were Republican partisans and politicians and did not support Franco’s regime: Martín was killed at the end of the Civil War in 1939, Juan and Jose in a “convent-prison” in 1942, and their father, Francisco, in 1941. The desire to know Martín by obtaining his body is also reflective of a Catholic sensibility. Luisa and Ana’s desire for his physical remains takes on a kind of sacramental symbolism, or what Basque anthropologist Joseba Zulaika describes as a “concern with certain limiting concepts having to do with life as a whole, the notion of death included” (2000: xxv). In Basque Violence: Metaphor and Sacrament, Zulaika examines sacramental symbolism as an analytic to understand the subjective expression of Basque political violence and terrorism in his hometown of Itziar. Apart from religion, he observes the everyday tension between metaphor and sacrament in Basque metaphors and myths as constituted in nationalist violence and narrated in cultural, psychological expressions of that ritual violence. In the same manner, Luisa and Ana’s desire for the body of Martín is reflective of their desire to take back his body from a regime and religious ideology that contributed to his death. To do so, Luisa and Ana “resacramentalize” (2000:48) that same body and person according their own values and practices: the exhumation. In August 2012, together with a local historical memory association, an archaeological team, and other families of the killed, we would spend one month searching for Martín and the other 200 persons killed in the San Pedro cemetery. Could one of these bodies be Martín? Figure 4: Ana takes a photo of six exhumed bodies, tied together at the wrists with electric wire, in the Castuera cemetery (September 1, 2012, photo by author). Ana visits the exhumation site where we are working in a section of the cemetery that, during the war, was considered separate from the sacred Catholic grounds; it was here that Republicans were killed and left in mass graves. Speaking from inside the grave with a cigarette cast to her side, Ana glances down at six exhumed bodies tied together at the wrists with electric cable. “For me, this is the homage,” she says without looking up, referring to the ritual devotion of the exhumation process itself, and not necessarily the identification of individual bones to body. I follow Ana’s gaze at the exposed bones before me and cannot begin to understand what bones and the exhumation process must mean to her and her family. Luisa and Ana knew that they might never be able to locate Martín’s bones. At most, they could only hope that the exhumation process itself—and not the actual exhumation of his individual bones but of someone’s bones—might purge Martín from his current place of violent death and obscurity. The desire to know and feel within her own body as to who her father is via the exhumation is a sentiment embodied by Luisa that in turn animates the exhumation process. The ethos motivating Spanish practices and rituals embodies what it means to be Spanish—and to have lost family during the war and dictatorship. Although the war and dictatorship were over and the Catholic Church no longer possessed the political power it had before, Luisa was doubtful of any formal form of reconciliation to take place in Spain in the near future. “No se cae ni la puerta de la iglesia, not even the door of the church falls,” she advises me, meaning that the institution of the church does not fall so quickly, the vestiges of its foundation lingering in the Spanish present. With her words in mind, the larger goal of my research has been to understand how such everyday personal and social interests, particularly those relating to a Spanish Catholic ethos, actively animate the exhumation process.